(Nanowerk News) A new chapter has been opened in our understanding of the chemical activity of nanoparticles says a team of international scientists. Using the X-ray beams of the European Synchrotron ESRF they showed that the electrons absorbed and released by cerium dioxide nanoparticles during chemical reactions behave in a completely different way than previously thought: the electrons are not bound to individual atoms but, like a cloud, distribute themselves over the whole nanoparticle. Inspired by the similarity of its shape, the scientists call this spatial distribution of particles an "electron sponge". The results were published on 12 November in the journal ACS Nano ("Absence of Ce3+ Sites in Chemically Active Colloidal Ceria Nanoparticles"). The team of scientists was led by Pieter Glatzel from The European Synchrotron (ESRF) in Grenoble (France) and Victor Puntes from the Universitá Autònoma of Barcelona, Catalan Institute of Nanotechnologies (Spain). The first author is Jean-Daniel Cafun from the ESRF. This photo shows Kristina Kvashnina and Pieter Glatzel preparing an experiment at ESRF beamline ID26 where the experiments were conducted. Today, cerium dioxide nanoparticles are widely used in industrial processes and also in consumer products. They are present, for example, in the walls of self-cleaning ovens and act as a hydrocarbon catalyst during the high temperature cleaning process. They are also a hot candidate for the next generation of lithium-ion batteries which will exhibit higher voltages and a greater storage capacity compared to today's energy cells. The element Cerium is abundant in the Earth's crust and can easily be mined and purified. However, without a thorough understanding of the chemical processes happening on the surface of cerium dioxide nanoparticles, it is impossible to optimise their current and future use. And to address a more complex issue, it is also impossible to assess the limits of their safe use. Most chemical reactions involve the transfer of an electron from one atom to another. In the past, it was believed that the electrons involved in a chemical reaction on the surface of a nanoparticle were localised in one of the atoms at the surface. 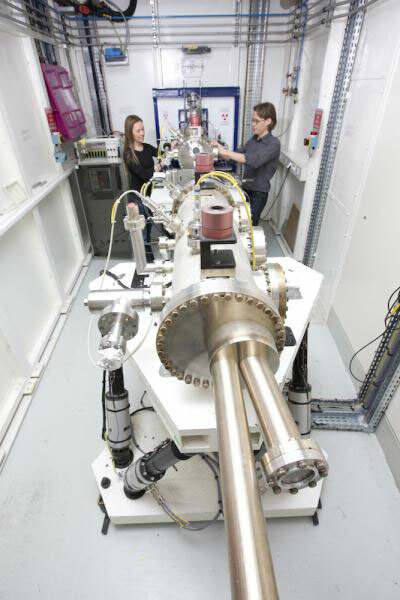 To determine the behaviour of the electrons during the reaction, the scientists used the intense X-ray beams at the ESRF to probe solutions of nanoparticles in water and ethanol. The nanoparticles had a diameter of 3 nm and consisted of several thousands of molecules of cerium dioxide. It is known that nanoparticles can change their behaviour under vacuum when studied with an electron microscope, for example. The scientists therefore carried out their experiment under realistic conditions, studying the nanoparticles in solution and in real time as the chemical reaction was taking place. "It was only possible to conduct these experiments in a liquid rather than under vacuum because we used X-rays as probes for the electron distribution." says Jean Daniel Cafun. 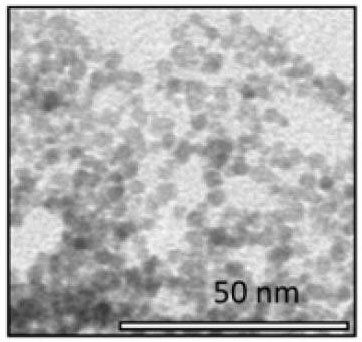 This is an image of the 3nm CeO2 nanoparticles taken with a transmission electron microscope. In their experiment, the scientists were successful in observing the creation of the nanoparticles in solution and then how these nanoparticles eliminated highly reactive molecules (reactive oxygen species, or ROS) from the solution. This elimination process mimics the role of an important enzyme in living organisms - catalase - that protects cells from these aggressive molecules. Cancer patients undergoing radiation therapy have high levels of ROS in their bodies and ceria nanoparticles have been proposed as a way of reducing the levels of ROS and thus alleviating the negative impacts of the therapy on the patients. Throughout the chemical reaction, the electronic structure of the cerium atoms and thus the redistribution of the electron cloud was monitored. "It is crucial to be able to study the chemical processes of the particles in an environment that is close to conditions found in biological systems." emphasizes Victor Puntes. "Scientists have been discussing the question: What happens when electrons are added to ceria nanoparticles? The work by Cafun et al. is a key study because it questions the present, widely accepted model and will lead the research in a new direction." says Frank de Groot, an expert on nanomaterials at Utrecht University who did not take part in the experiment. The next step, which has already been initiated, will be to assess whether non-localised electrons are a property of cerium dioxide only or also of other widely used nanoparticles like titanium dioxide. "In parallel, chemists have to revisit their theoretical models to explain the chemical behaviour of nanoparticles and to better understand how electrons are transferred in chemical reactions taking place on their surface." concludes Pieter Glatzel.